Hundreds of citizens living in RW 4, 5 and 6, Duri Kosambi Urban Village, Cengkareng, West Jakarta, undergoing socialization, as well as fire and training prevention held by Jakarta Fire Handling and Rescue Dept., Tuesday (10/31).
" And now we're holding it in Cengkareng Sub-district, as this is now ranked first in fire-prone areas in Jakarta"
Jon Vendri, Section Head of Prevention for Jakarta Fire Handling and Rescue Dept. stated, besides socialization and training, his dept. also inaugurated citizens who are members of the fire taskforce. He said it has been held since 2012 by focusing on densely populated areas, such as Tambora Sub-district that ranks third area of fire-prone areas in the capital. "And now we're holding it in Cengkareng Sub-district, as this is now ranked first in fire-prone areas in Jakarta," he expressed, Tuesday (10/31). He has made a program plan over the next five years, especially in densely populated areas prone to fire where every residence has one portable fire extinguisher (APAR). "Next year we will share APAR in each RT and RW that spread in densely populated area," he told. 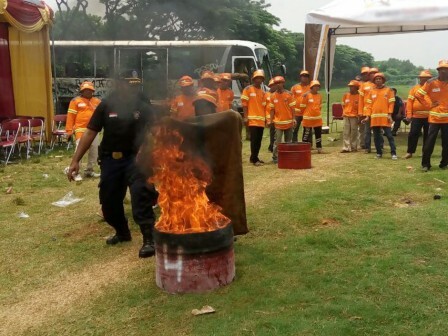 Assistant for West Jakarta Administration, Denny Ramdany hoped, citizens who follow fire prevention training will be ready to help in case of fire in their respective areas. "I hope citizens can become volunteers to join directly with the fire dept.," he closed.